The Samsung Galaxy S7 and S7 edge have started receiving a new update. 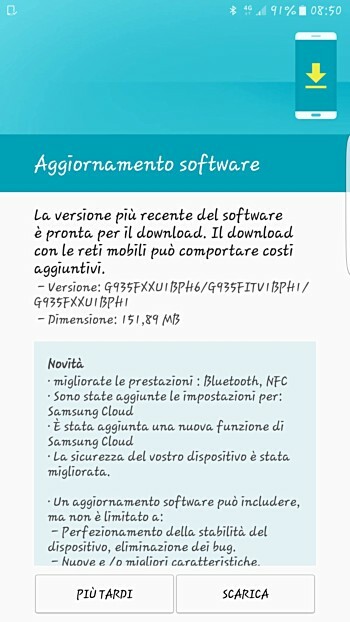 Currently rolling out in Italy, the update brings Samsung Cloud, the cloud service that made its debut with the company’s recently unveiled Galaxy Note7 smartphone. In addition, the update – which weighs in at around 152MB – also includes Android security patch for the month of August, as well as some NFC and Bluetooth-related performance improvements. As is usually the case with OTA roll-outs, it may take some time before the update hits your device. Meanwhile, if you feel impatient, you can manually check for the update by heading to your handset’s Settings menu.